Coliform bacteria are a closely related group of bacteria species that live in the intestinal tracts of animals and are generally not harmful to human health. A few types of bacteria within the total coliform group, most notably E. coli, can cause serious illness. Coliform bacteria are common in the environment and are easily identified during routine water testing; therefore they are frequently used as indicators that a water supply may be contaminated. If coliform bacteria show up in a water sample, it is possible that disease-causing bacteria, viruses, and parasites are also present. We run coliform bacteria samples using the Colisure and Colilert methods. Media is added to the sample and incubated for 24 hours. 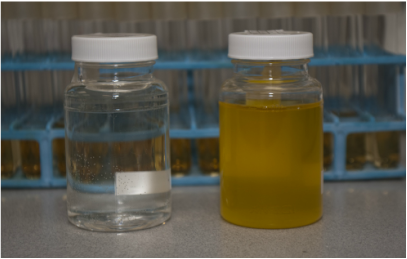 A yellow color change (Colilert method) indicates that total coliform bacteria is present in the sample (the sample is positive). What if my water tests positive for coliform bacteria? If you receive a "present" (aka. "positive") result, the water should not be consumed unless is it first brought to a rolling boil for at least one minute, or the system is chlorinated. The chlorination process will disinfect the system of the coliform bacteria and any other potential pathogenic species that may be present. Once the well has been chlorinated, another test should be done to confirm that total coliform is no longer present before the water is considered safe to drink.